When it comes to restorative options for replacing missing teeth, dental implants are widely regarded as the most complete and natural-looking method available from dentists today. That’s why Dr. Henkel is proud to offer them to patients at both his Philadelphia and Horsham offices. However, if you’ve recently experienced tooth loss due to decay or injury, you might be feeling hesitant or confused when faced with the idea of dental implants. What exactly are they made of? How long will they last? Do I really need one? Don’t worry – here at Horsham Dental Elements, we want you to have all the information you need to feel confident in your dental care. 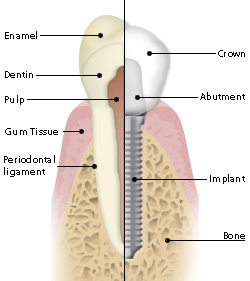 That’s why we’ve provided answers to some common questions about dental implants below! A dental implant is a small titanium post that is surgically attached to your jawbone. Once this anchor has successfully fused with your bone tissue, Dr. Henkel will attach a custom-made, permanent crown to it that will blend in seamlessly with your smile. The longevity of your dental implants depends on a number of factors, including age and personal hygiene. However, most implants that are cared for properly go on to last a lifetime! Am I good candidate for implants? Dr. Henkel will be happy to evaluate your unique mouth in order to determine whether dental implants are a good fit for you. While most patients are candidates, your chances of success with this treatment will be improved if you have good oral health, don’t smoke or drink, and have adequate jawbone structure. What will happen if I don’t replace my missing tooth? When you have gaps in your smile, your other teeth often begin to twist and shift in order to fill it, resulting in bite collapse and TMJ pain, among other problems. You’re also at a higher risk for gum disease and additional tooth loss. Why should I pick dental implants over other restorative options? Dental implants are the only restorative dentistry solution that effectively replicates your entire tooth structure, not just the crown. When you lose teeth, your jawbone begins to deteriorate because the root of the tooth is gone – dental implants replace this part of this tooth too, which will maintain and even regenerate bone tissue! Additionally, dental implants tend to be more comfortable, more permanent, and more natural-looking than other tooth replacement options. Don’t suffer from unsightly gaps a day longer – Dr. Henkel is well-known for concise, comprehensive care that can restore full health and beauty to your smile. Contact our offices in Horsham and Philadelphia today to schedule an appointment. Our team also welcomes patients from Montgomery, Buck County, and beyond!